New CD of Full-X will be presented in Polish Radio Rzeszow 9.1.2013 at 8 p.m. local time (GMT+1). Broadcast link. Dec 29, 2013 - Full House in "Baszta"
Check out pictures from gig in Baszta club in Ostrzeszow. Full House (sold out long time before premiere gig of "An Introdutction to Counterpoint" CD. Check out photos from Workshops at the Great Guitar Escape 2013 by Adam Fulara (NYC, U.S.A.). The drummer site has been updated. Check it out. Critical Acclaim has been updated. Paul Gilbert - In the new stuff, Adam's really grown musically. The first [recordings] were full of fire and very athletic - and it's Bach, so it's beautiful - it's very much in your face. The new stuff had great dynamics and great vibrato even with a very unusual technique. Everything had a great sense of timing, and I realized, this is really a guy to look out for. Wojtek Pilichowski - Full-X is like a train, which nothing can stand in the way. Sometimes it will be an obstacle, and it seems that it can not be beat, but the Full-X hits and cuts it in half going on. One another gallery with artists playing at the Bass Days 2013 Poland (Yolanda Charles, Wojtek Pilichowski and others). Check out photos from bass workshops at the Bass Days 2013 Poland (Olsztyn 2013). Workshops by Tom & Adam Fulara. Check out drum solo from gig in Trzebnica. 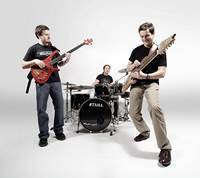 Michal Bednarz is playing "Fast and Serious" tune from new CD of Full-X trio. After good gig at the Bass Days Poland 2013, and very good gig in Wroclaw, it was very successful gig at the "All Souls' Day Jazz Festival" in Trzebnica. "An Introduction to Counterpoint" starts to be an bestseller. Full house and big applause... Check out the photos. Check out photos from successful premiere of the Full-X trio CD "An Introduction to Counterpoint" in Wroclaw. Polish language. Interview in Polish TV Amazing, about new CD "An Introduction to Counterpoint"
"Full-X is like a train, which nothing can stand in the way. Sometimes it will be an obstacle, and it seems that it can not be beat, but the Full-X hits and cuts it in half going on" (W. Pilichowski, festival director). Check out new pictures from the festival. Photos from Bass Days 2013 Poland has been published in the "Bass Player" Magaxine Polish ed. Tom Fulara has bass workshops about double thumbing technique. Full-X trio performed at the Festival with Wojtek Pilichowski, Krzysztof Scieranski, Yolanda Charles and others. Check out photos from rehealsal before gigs of Paul Gilbert and Adam Fulara at The Great Guitar Escape 2013 (Big Indian, New York). Adam Fulara is player of the October 2013 at the twohandedplayer.com. The scientific work of polyphonic improvisation published in the journal Avant 2/2013. For all musicians interested into counterpoint improvisations. "An Introduction to Counterpoint" CD is the best illustration of the method described in the article. Check out photos from recording session to music video "Colosseum" from the "An Introduction to Counterpoint" CD. Check out photos from live show in Polish TV Amazing with Adam Fulara and Jacek Krzaklewski from Polish band "Perfect". Check out photos from interview in Polish TV Amazing (Andrzej Dabrowski). Review of the new CD "An Introduction to Counterpoint" and Paul Gilbert's Great Guitar Escape. Play Studio, Sep 20, 2013. Broadcast of TV program in Polish TV. Adam Fulara has played a tune from new CD, as well as short jam session with Jacek Krzaklewski at the end (last 3 minutes). Inside interview, and clip of Colosseum from new CD. Sep 12, 2013 - Clip "Colosseum" from new CD! Sep 11, 2013 - Photosession for "An Introduction to Counterpoint"
Colosseum is the tune from new Full-X CD "An Introduction to Counterpoint" Now it's available to listen online. Sep 09, 2013 - New CD of the Full-X available! 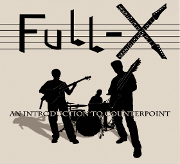 Check out the new Full-X CD: "An Introduction to Counterpoint" you can buy it online here. You can also purchase download links, if you prefer MP3 files, or buy it with Fulara's book+DVD with discount. Adam Fulara was a guest in "Made in Poland&qout; Polish Radio Centrum Kalisz. Check out the photos. Jul 05, 2013 - New CD of the Full-X is comming! New CD of the Full-X "An Introduction to Counterpoint" is comming! Premiere will be at the Great Guitar Escape, where Adam Fulara will be one of the teachers and performers. After the event, in July it will be accessible as CD and as MP3 via this website, and then in online shops too. Check it out! Check out Paul Gilbert with Andy Timmons Interview on the Ibanez site. Part of the interview is about Adam's music. 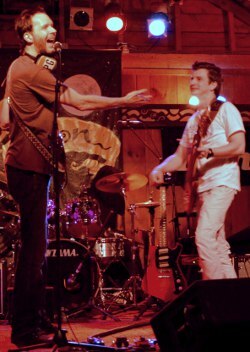 Paul Gilbert: "(...) In the new stuff, Adam's really grown musically. The first [recordings] were full of fire and very athletic - and it's Bach, so it's beautiful - it's very much in your face. The new stuff had great dynamics and great vibrato even with a very unusual technique. Everything had a great sense of timing, and I realized, this is really a guy to look out for.(...)". Adam Fulara will be one of the teachers at the Great Guitar Escape (New York, July 2013). Check out new photos from Polish Radio 3 (Jan 2013), Adam Fulara has presented music from new Full-X trio CD "An introduction to counterpoit"and told about The Great Guitar Escape - gigs and workshops in New York City area with Paul Gilbert.